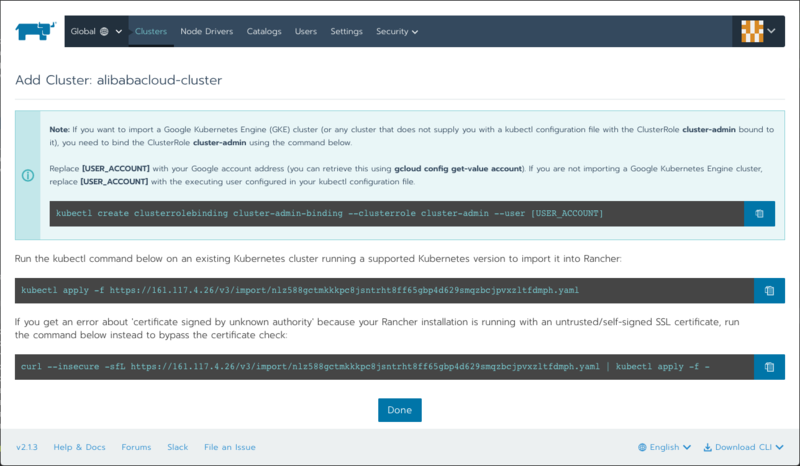 Rancher is a multi-cluster Kubernetes management platform. 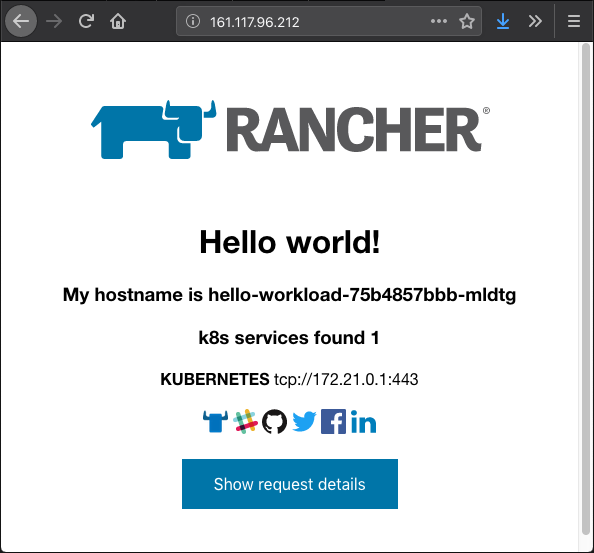 The goal of this tutorial is to explain how to setup Rancher on a single node and how to integrate it with Alibaba Cloud Container Service. To follow this topic, you need to create an Alibaba Cloud account and obtain an AccessKey ID and Secret. Cloud resources are created with Terraform scripts. If you do not know this tool, follow this topic and familiarize yourself with the Alicloud Provider. Make sure you are familiarized with Kubernetes. If you need, you can follow this tutorial to learn the basics. You will also need to setup the command line tool kubectl. Important: please download the related resources before moving to the next section. We will choose the first way as it makes things simpler. Apply complete! Resources: 9 added, 0 changed, 0 destroyed. Open a web browser tab and enter the URL corresponding to https://rancher_eip_ip_address (for example, https://161.117.4.26/). Your web browser will complain that the connection is unsecured (which is normal because we did not configure any SSL/TLS certificate). Make an exception and continue browsing. Note If using an invalid certificate bothers you, follow this documentation to setup HTTPS properly. Set an administrator password and click Continue. The next step asks you to configure the server URL. Keep the default value and click Save URL. 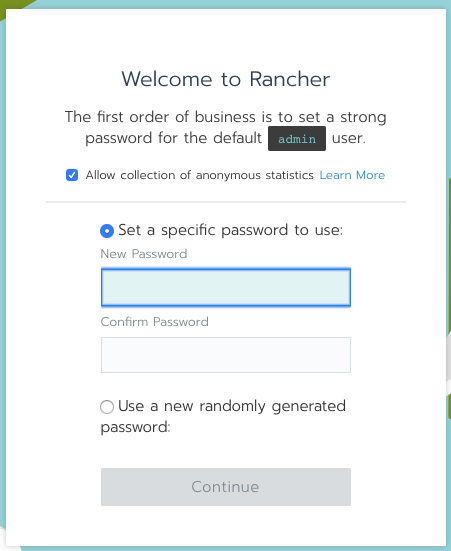 Unfortunately the integration with Alibaba Cloud Container Service is not yet supported by the current version of Rancher (v2.1.3). However, we can create a Kubernetes cluster with Terraform and import it manually to Rancher. 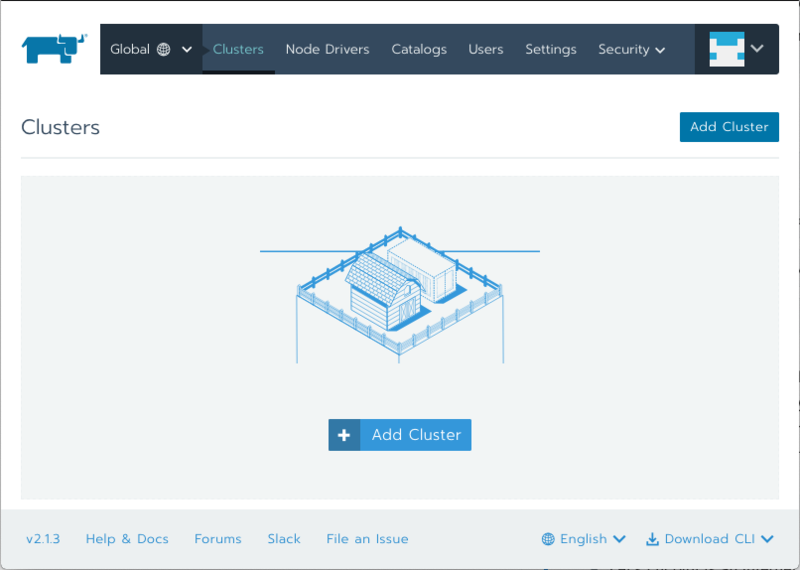 Before creating our cluster we need to size it correctly. Currently in Alibaba Cloud, a Kubernetes cluster must have exactly 3 master nodes, but the node instance types (number of CPUs and amount of RAM) and the number of worker nodes are flexible. Note this document is a good introduction about the master and worker node concepts in Kubernetes. According to the same article, the disk size for each master node does not need to be large, as it mainly contains the OS (about 3 GB), docker images, system and application logs, temporary data, and so on. This second document in Chinese explains how to choose the number and the type of workers nodes. It also provides information about network driver, disk size selection and other management tasks. A small number of large workers increases the chance of having interdependent containers running on the same machine, which greatly reduces network transmission. Large resources (such as network bandwidth or physical RAM) concentrated on few nodes allow better resource utilization. For example if two applications need 1 GB of RAM, it is better to collocate them on one worker with 3 GB of physical RAM instead of distributing them on two workers with 1.5 GB of physical RAM each; in the first case the large worker is able to accept a third application that would also need 1 GB of RAM, whereas the two small workers cannot. Pulling Docker images is more efficient on a smaller number of workers, because images are downloaded, stored on the local disk, and then re-used between containers. However a too small number of workers is not a good idea, because a system should continue to function even if a worker node is down. The exact number of workers depends on the total number of required vCPUs and on the acceptable fault tolerance. If the fault tolerance is 10%, we cannot lose more than 16 vCPUs, so a valid configuration is 10 workers with 16 vCPUs. If the fault tolerance is 20%, we cannot lose more than 32 vCPUs, so a valid configuration is 5 workers with 32 vCPUs. About the amount of RAM for each worker, the document gives the following rule of thumb in case of applications that are relatively greedy in memory, such as Java applications: a good ratio is 8 GB of RAM per vCPU, so if we choose an instance type with 4 vCPUs, then we need to take about 32 GB of RAM. Alibaba Cloud Container Service is designed to support either 1 or 3 availability zones. To be compatible with most of the regions, we can only use 2 availability zones, so we will need to configure our Kubernetes cluster to use twice the same availability zone. The minimum number of worker nodes is 3. Apply complete! Resources: 16 added, 0 changed, 0 destroyed. Note Do not worry if the operation takes some time. 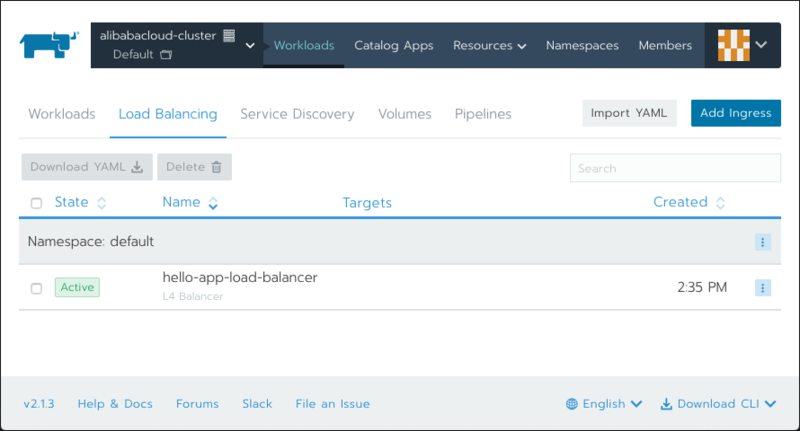 Creating a cluster typically takes about 15 minutes. # Note 0: the IP address is the one from `rancher_k8s_cluster_ip_address`. # Note 1: the password is the one that was set in `TF_VAR_ecs_root_password`. Now that we have our Kubernetes Cluster, let’s import it into Rancher so that we can manage it from there. The current page must be the Clusters one. Click Add Cluster. 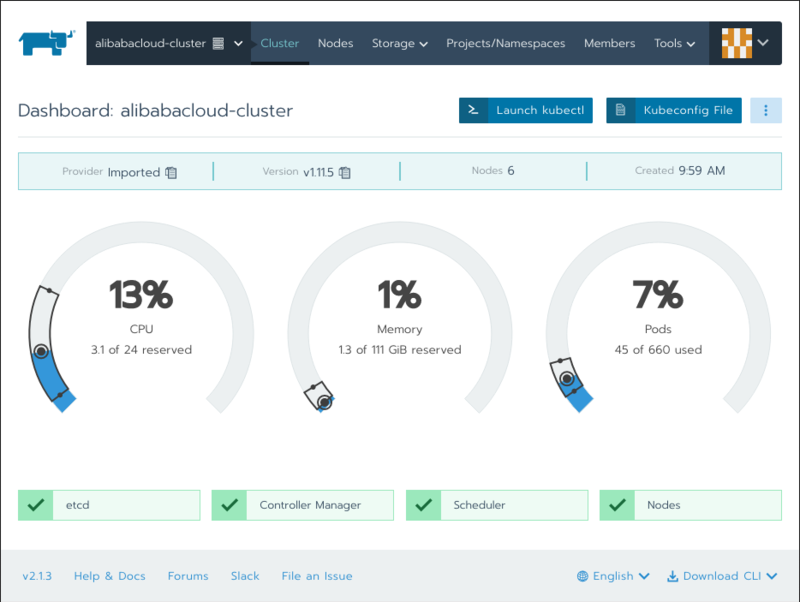 Set the Cluster Name field to alibabacloud-cluster. In the top menu, select Projects/Namespaces. This page displays two projects Default and System. Click Default. The new page displays the workloads, but it is empty for the moment. Click Deploy. Scroll down and click Show advanced options. Expand Labels & Annotations and click Add Label. Set the key app and the value hello-app. Congratulation if you managed to get this far! If you want to continue to learn about Kubernetes and Rancher, see the official documentation.